I’ve been having so much fun with my winter capsule wardrobe, that I was a little sad when I turned the page in my planner to see that it was time for a spring refresh. 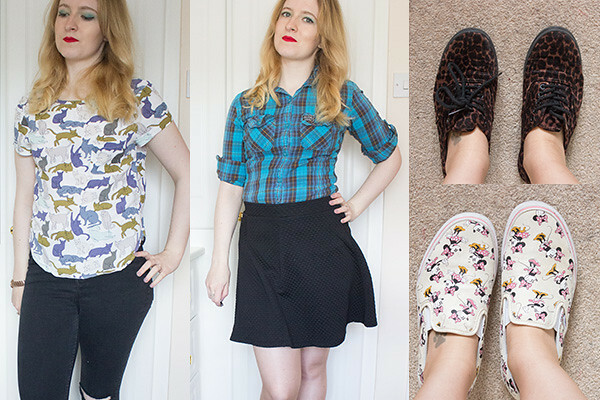 Wearing 30-something items of clothing for three months sounded a little limiting, but for me it’s been quite the opposite and has given me chance to try out and find ‘my style’. As it turns out, it’s fairly monochrome and simple. Being able to go to the wardrobe and know I won’t have to look too hard to find an outfit for the day has made my mornings much easier. And to top to off, my wardrobe is definitely tidier – which makes fishing the cat out of there slightly easier. 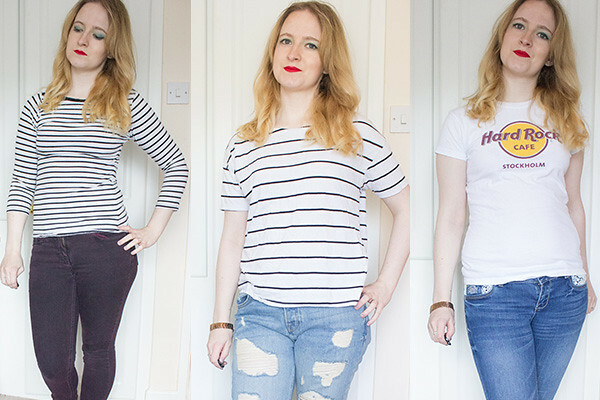 Over the last three months, I have identified some gaps in my wardrobe and filled them for my spring update. I’ve got 37 items of clothing in my capsule, though a few of those are ones I’m not too sure about and I’m going to give it a month and if I’ve not worn them much, they’ll be going. 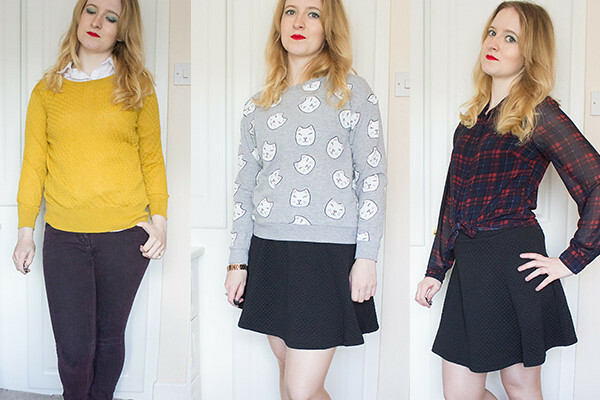 When I posted about my winter capsule wardrobe, you wonderful people said you wouldn’t mind seeing the contents of my wardrobe. Your wish is my command. I’ve included links to exact items where I can, but a lot of things aren’t for sale anymore, so I’ve included similar items instead. It was love at first sight when I saw this coat. It was exactly what I was looking for after my old coat got a bit tatty, bobbly and furry. The pattern is beautiful, it’s perfect for the changeable temperatures of spring, and it has pockets. 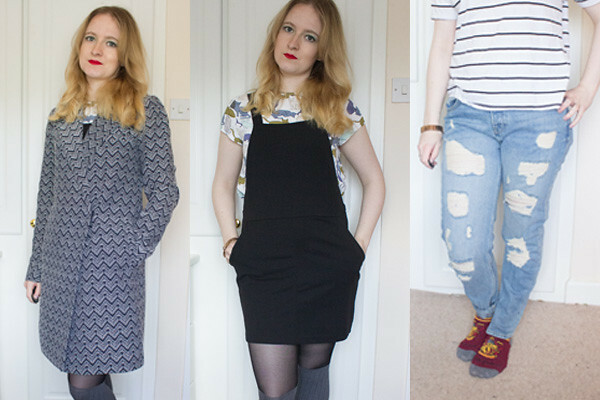 The 90s trend is making me feel pretty old at the moment, though I do love reminiscing and the pinafore dress is my favourite piece of clothing from that trend. These are the biggest surprise addition to my wardrobe. I’ve always liked the look of boyfriend jeans on other people, but wasn’t convinced that I could pull them off at all, but I’ve been getting some serious usage out of these. This thing is so soft it’s unreal. I really like it but I had to put it in storage during my winter capsule as it’s just too thin to get any real use out of over the colder months, so I’m really looking forward to wearing this again. I’d completely forgotten I had this shirt, so it was a pleasant surprise when I rummaged through my storage drawer and found it. This is so comfy and simple, but to my annoyance I’ve spotted it’s got a stain on it – thinking about it, I think it was an accident with tomato sauce. I’m hoping I can get it out – if not, I shall weep. 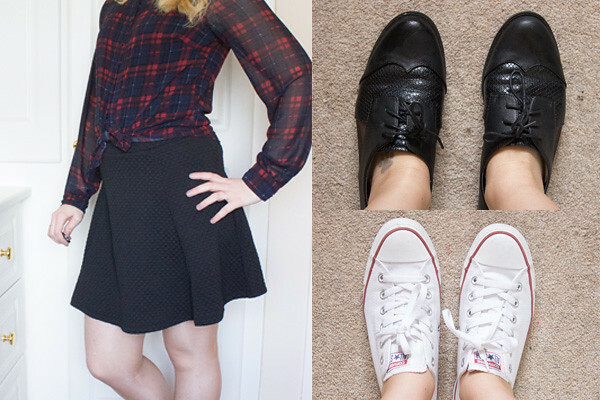 If there’s one thing that was really lacking from my winter wardrobe, it’s a black skirt. I’m so particular when it comes to skirts in terms of the waistline and how long it is, that it took me ages to settle on a skirt I liked; once again, H&M did me proud. After my Keds fell apart, there was a pump-shaped hole in my wardrobe, and you can’t go wrong with Converse. 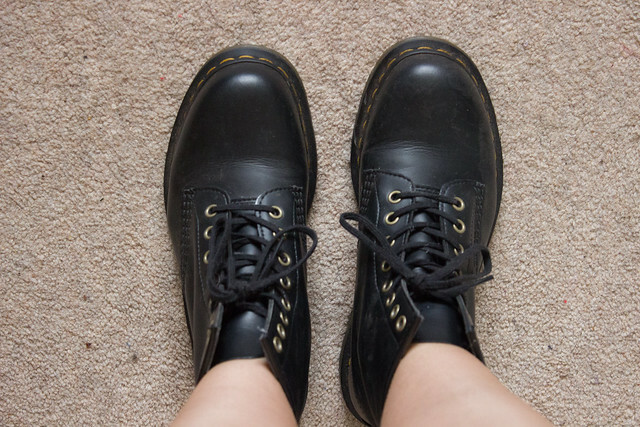 We all need a comfy pair of cute black shoes – especially when you’re on your feet for 10 hours at work. 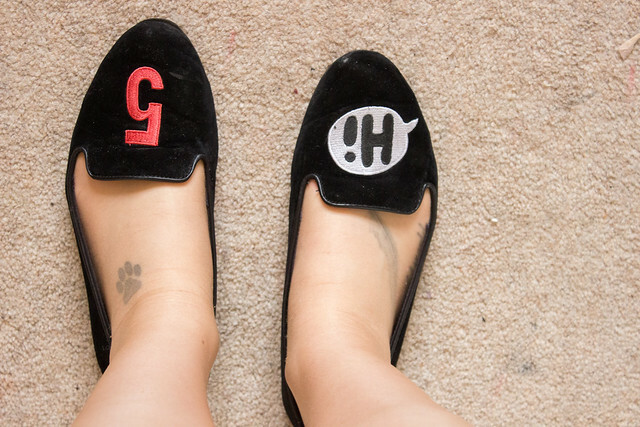 Because sometimes you need to show off your inner cat lady. I don’t really wear this as much as I used to anymore but I can’t bare to throw it out, so I’m giving myself the run of this capsule wardrobe to see if I get any more use out if it. If not, it’s going – though that’s easy for me to say now. It’s time to begin adding a splash of leopard print to my outfits again. I don’t even need to say a thing about these. 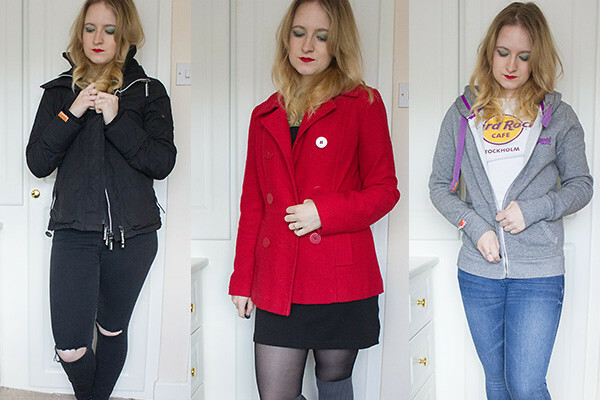 The things I loved so much from my winter wardrobe that I will be carrying over into the spring wardrobe. I rediscovered this bad boy when I started my capsule wardrobe. My mum bought it for me at least six years ago and it earned the nickname “the Elmo coat” when I went to New York and had a photo taken with Elmo in Time Square and I blended into him. 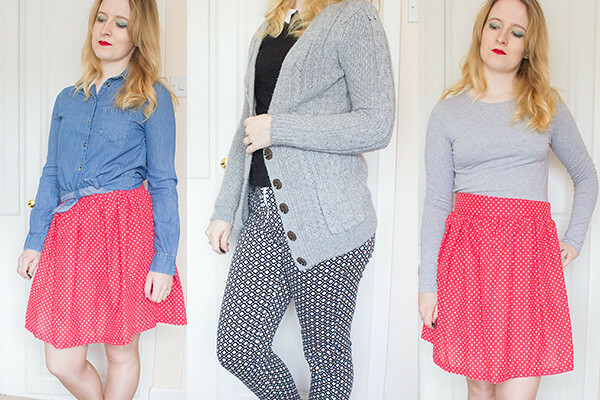 With such a monochrome wardrobe, this is a fun way to brighten things up. There’s not much to say about this, apart from I can’t imagine a time where my wardrobe won’t contain a Superdry hoodie. This was my present to myself when we went to Disneyland Paris, and I need to wear it more – just look at the ears! 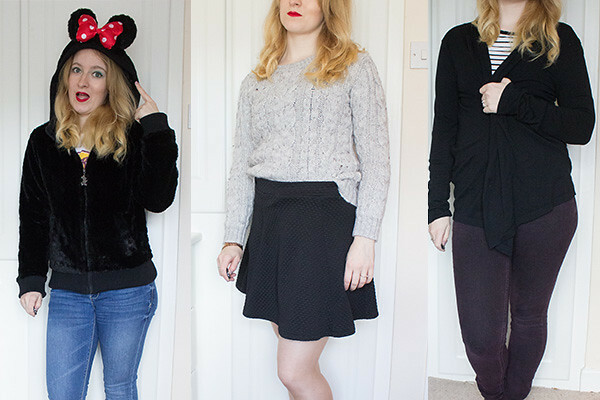 Everyone needs a nice, cosy black cardigan in their wardrobe. This is so comfy and cosy, and goes with so much. This formed part of my favourite outfit – paired with burgundy jeans, it just made such a lovely autumny / winter outfit. I spotted this when I was in Stockholm last year, and it was the purrfect (see what I did there?) replacement for a cat jumper I’d thrown away a couple of months earlier due to overuse. This is one of my most worn items of clothing and I’m pretty sure it will stay in my wardrobe until it falls to pieces. I can’t get enough of stripes, and this is one of my most worn items. Because one stripy top isn’t enough. I’m impressed with myself that I only have two Hard Rock Cafe t-shirts in my wardrobe because I buy one from every HRC I go to. As well as being one of my favourite bands, this is one of my favourite t-shirts. 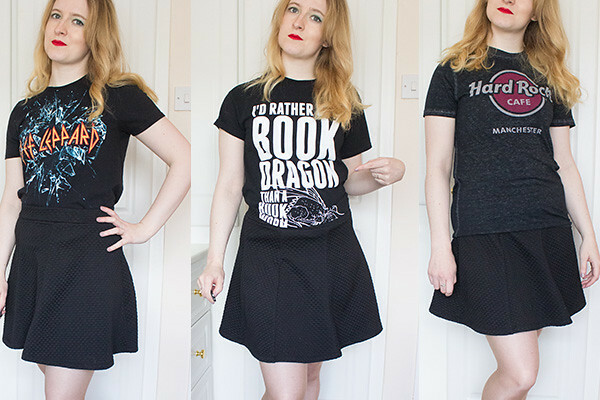 Sometimes, you just need to tell the world about your love for books via your clothing. I just love this classic design. 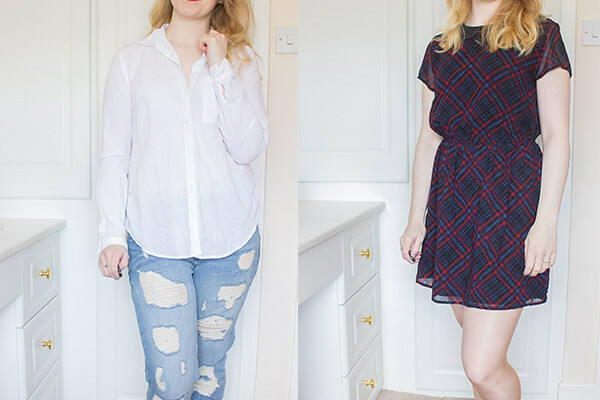 Admittedly, I’ve not worn this white shirt a huge amount but while taking the photos for this blog post I wondered why on earth not because it’s so versatile. As this was the only dress in my winter capsule, it got a lot of usage and I’m definitely not ready to put it into storage. I think it’s one of those staple pieces that will only leave my wardrobe when it falls apart. I really like adding a splash of colour with these. These are pretty adventurous for me, and I’ve worn them much more than I thought I would. I love the cut and feel of them, and to be honest it took a lot of self control for me to not buy a pair in every pattern they do because they’re such pretty statement items. When you’ve got a 20 minute walk in the rain, you need a pair of comfy, waterproof boots. 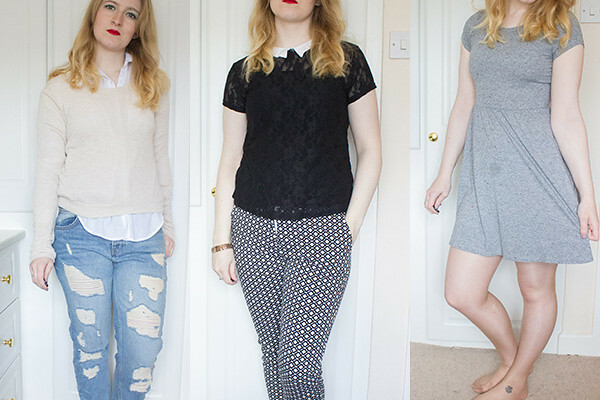 These are the items of clothing that I really like but haven’t worn as much as I’d like to. I’m going to give myself a month to wear these more, and if I don’t get more use out of them, I’ll remove them. I made this last summer, but I’ve probably only worn it a handful of times, and I know I could get some more use out of this. I think part of the reason is that this is just too light for winter. I think I can count the amount of times I’ve worn this shirt during the past three months on one hand. I’m hoping to get some more use out of it this spring, though. This is so comfy and cosy, but I think it’s been a little neglected because it’s too thick to wear comfortably under a coat, but the weather isn’t quite warm enough yet to wear this. I love these shoes, but the last few times I’ve worn them they’ve hurt my feet. I’m going to give them another few wears and if they’re still torturing my feet – it’s out with them. 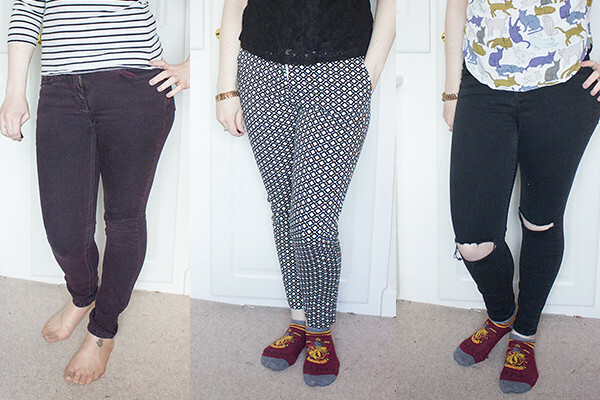 Phew, that is it; my spring capsule wardrobe. I hope you enjoyed having a nose at my wardrobe. It was a lot of fun to make this post, even if my family think I’m a little weird for it. What are you adding to your wardrobe this spring?